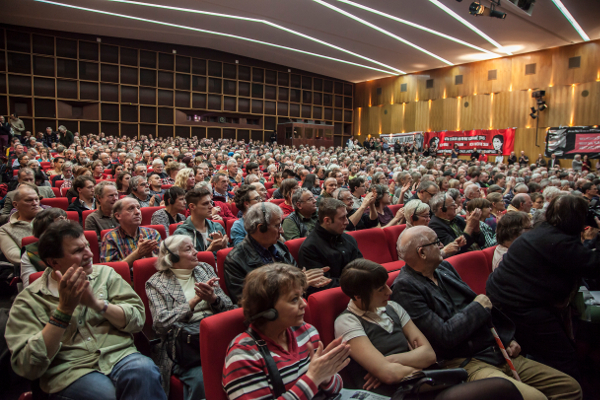 On January 10th, 2015, over 2000 people came together for the 20th Rosa Luxemburg Conference in the Urania event centre of Berlin. The main theme of the conference was »Peace instead of NATO«. Amongst others, the Indian economist Radhika Desai, the politician Oskar Lafontaine, Peter Mertens from the Worker's Party of Belgium and the US journalist Linn Washington were keynote speakers. NATO is moving east and the US Secretary of Defense recently proclaimed that Russia has advanced towards the threshold of the NATO member states. In the Ukraine, NATO supports a government that is crawling with fascists, who are leading a war against their own population. Nonetheless, the NATO member states accuse Russia of being the aggressor. For them, the cold war was never over. junge Welt, September 1st, 2014Since more than 20 years, NATO has been leaving a trail of blood behind itself, well beyond the perimeters of Europe. Since it forcefully intervened in the breakup of Yugoslavia in the 1990s, NATO has lead wars of aggression outside of the treaty area. It declared that these wars were »coalition cases«, and therefore defense was necessary in these cases: Afghanistan, Horn of Africa, the Mediterranean, Somalia, Libya and, de facto, Syria. The path from the alleged defensive alliance during the cold war with the Soviet Union to the mission coalition, which lays claim to global dominance, was taken one step at a time. Currently, the Alliance is reaching a new level of aggressiveness and warmongering: it is provoking new conflicts in Europe, the Near- and Middle East and Africa, in which its own troops and troops from other countries are fighting. The aim is to create wars that don't end. For example, Afghanistan: 2015 was meant to be the first year in which NATO troops would no longer occupy the country. On the 6th of November, the new NATO Secretary General Jens Stoltenberg assured Afghanistan of long-lasting »support« - allegedly in order to train local security forces. That means: Officially, the 12,500 troops, which belong to the »North Atlantic Alliance«, will stay, in order to »defend« the Hindu Kush. NATO means the permanent build-up of arms. The expenditure of NATO member states on arms was 669 billion US Dollars in 2001. By 2011 it had risen to 1039 billion US Dollars. NATO means the strategic planning of the first use of nuclear weapons. During the year of the 70th Anniversary of the liberation of Europe from fascism, the speakers of the 20th Rosa-Luxemburg-Conference will speak about this. Yes, this is me, Thersites – vilifier of all wars, their generals, their propagandists and their professors. Message of greeting from Mumia Abu-Jamal, journalist and political prisoner in the USA. 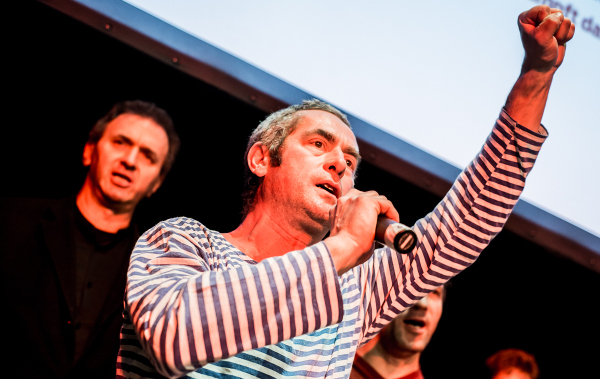 Gian Paolo »Picchio« Picchiami, lead singer of Banda Bassotti, and tour manager David Cacchione speak about their solidarity concerts in the struggle against the advance of fascist battalions in eastern Ukraine in Rome, Moscow, Rostow on the Don and in the Donbass region. Hans Modrow (former Prime Minister of the GDR, Chair of the Council of Elders of the party DIE LINKE) and Volker Hermsdorf (jW author) about their new book »Amboss oder Hammer. Gespräche über Kuba« (A Rock or a Hard Spot. Conversations about Cuba). The date for the US military strike against Syria was already set: September 2nd, 2013. Why it didn't happen is still unclear, however Russia seems to have played a part in that. Since then, the German media, especially the public broadcasting corporations, have been set on a »hot war« against Moscow. They no longer want different sides to exist on the question of war and peace. And those, who actively oppose their agitation, are stamped as Russian-driven or members of sects and »conspiracy theorists«. 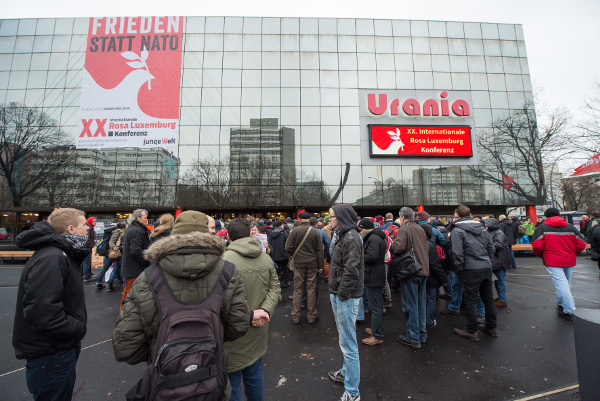 However, as a matter of fact, there is more discontent about war politics and unanimous press in Germany than ever before and activists are mobilizing locally and across Germany against arms, NATO wars and nuclear weapons. 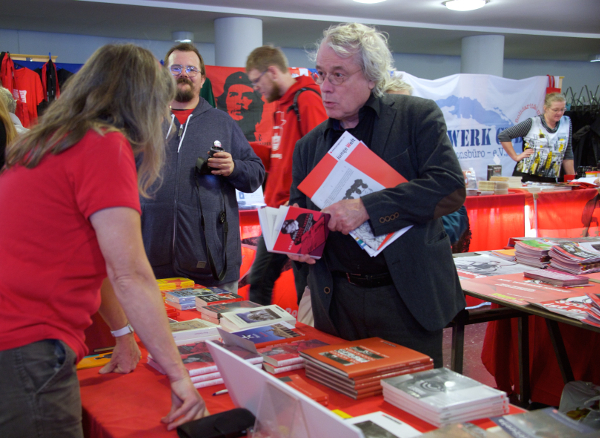 Some of them are coming to the 20th Rosa-Luxemburg-Conference in order to talk about their activities. With a contribution by Sharon Dolev, Founder and Director of the Regional Peace and Demilitarization Movement in Israel (RPM). The main goal of the NGO is to create a zone free of weapons of mass destruction in the Near- and Middle East and achieve the global prohibition of nuclear weapons. 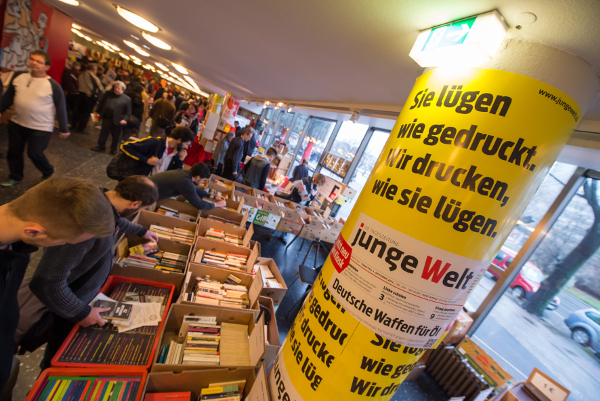 At the GDR Writers Congress in March 1990, the poet Ronald M. Schernikau, who had just migrated from West Berlin to East Berlin, stated: »In order to prevent talking about politics, the West has applied an old trick and introduced morals. Morals, because these cause people to choose the most gut-wrenching standpoint of all and thereby make it impossible to act. That's why morals are so popular.« Since around this time, the corporate and state media in Germany have been working on creating a situation, in which the population and war opponents are unable to act. Wars are allegedly led to ensure democracy and human rights – and not to gain resources or create spheres of influence. Dota Kehr is also known as »Die Kleingeldprinzessin« (the loose change princess). She brought this name back from her travels around the world, during which she performed as a street artist. After gaining a lot of experience, she looked for support from more musicians and met three musicians, who are happy to try out new things. Since then, the born and bred berliner musician sometimes plays solo and sometimes plays with her band »Die Stadtpiraten« (the city pirates). She publishes her own CD’s with her own publishing company. At the moment, she is on a tour, presenting her new album »Wo soll ich suchen« (where should I search). Banda Bassotti founded itself in 1981 in Rome. They were a group of politically active craftsmen, who got together in order to fight fascism and struggle for oppressed people in many countries of the world. Their revolutionary texts and conversions of international workers songs quickly made them into a crucial part of the Italian resistance scene. They were always present at important demonstrations. Their last album, »Banditi Senza Tempo« (timeless bandit) was released in May 2014. The Pokes rock. And their music is great to dance to. Without forgoing musical and lyrical refinement, when playing live, they really show the essence of their band and the music they make. Sound, voice and texts offer enough unique features, but when they are on stage, the quality goes up a notch. Unique folk punk without blinds – Pokes style. In their eight years of existence they have already published four albums. After a successful start last year, the group Tendenzen Berlin decided to organize another exhibition in 2015 – at the 20th International Rosa-Luxemburg-Conference. Many artists have submitted their artwork, which centers around the theme: »No, we don't want your wars – a better world is possible«. The jury selected the best pieces for the exhibition. 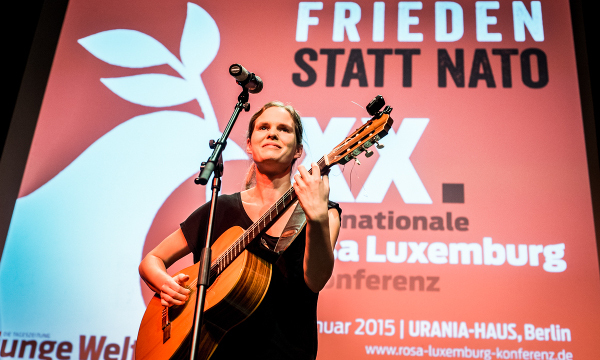 The International Rosa Luxemburg Conference will take place for the 20th time in January 2015 – as always, on the day before the traditional Liebknecht-Luxemburg-Demonstration in Berlin. 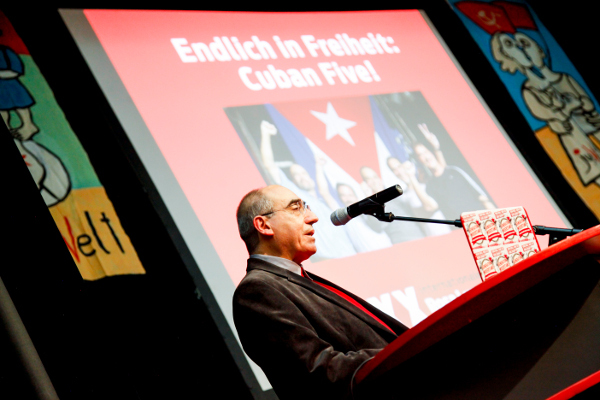 The conference was initiated by the supra-regional, Marxist, independent newspaper junge Welt. 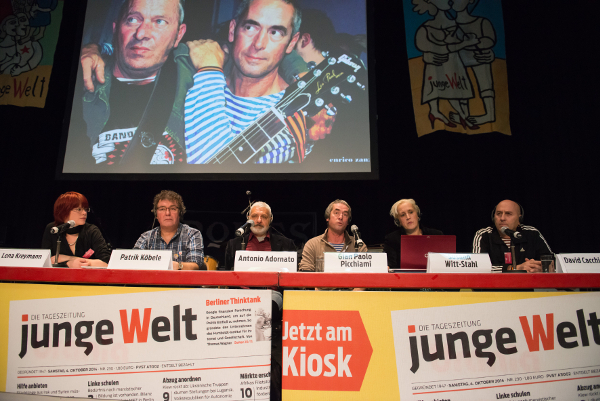 The emphasis of the event lies on presenting and discussing experiences, analyses and activities of leftist movements and political parties around the world and developments and political struggles in Germany. As we are celebrating the 20th anniversary of the conference, we decided to dig out the old posters from all of the conferences that we organized over the years, in order to show these to our visitors. 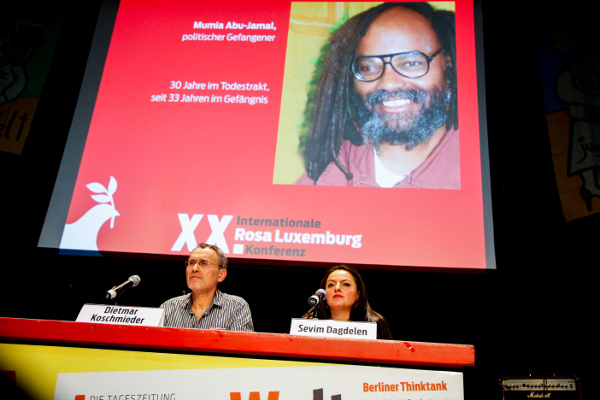 20 years of International Rosa-Luxemburg-Conferences – 20 years of lived international solidarity! Low wages, mini-, part-time and side-jobs, but also poverty and unemployment are daily experiences for more and more young people in Germany. The minimum wage, which will take effect as of 2015, is more like Swiss cheese than a guarantee for a minimum wage. And even those, who receive the minimum wage, are not protected from poverty. The panel speakers will discuss how the casualization of work, which is spreading quickly, can be stopped. They will also discuss the meaning of the struggle for a minimum wage for training and they will look at which approaches for successful struggles within organizations and with trade unions are on offer. 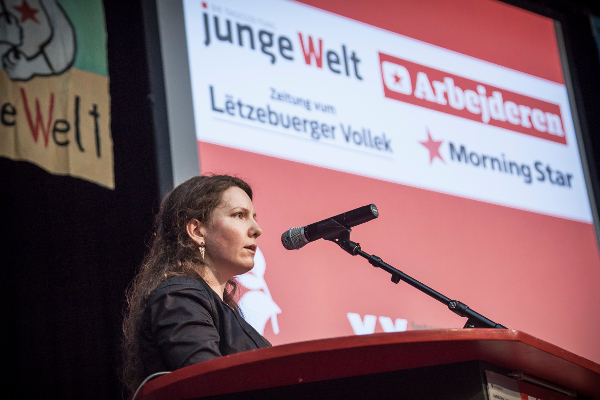 Activists from the trade union youth organizations, left youth organizations and coalitions will discuss these issues with representatives of the SDAJ (Socialist German Workers Youth). Sharon Dolev is the initiator of a new Israeli grassroots anti-nuclear movement and the coordinator of a series of events held in Israel. She heads the Regional Peace Movement (RPM), formed to support the Arab Peace Initiative, and is a veteran campaign organizer for peace, environmental and human rights organizations in Israel. She is also the Peace and Disarmament campaigner for Greenpeace Mediterranean and the Israeli Greenpeace office director.